Some of you, like myself, already have a large library of royalty free music that came with a piece of software. Final Cut Studio 2 came with a huge library of thousands of tracks and loops. Unfortunately only about 400 of the 6000+ tracks on my system are complete audio tracks, the rest are loops and samples. After 3 years of use in projects I’ve kind of exhausted those 400 tracks. Of course I haven’t used all of them but I have come to the point where I need more. For my last video I got in touch with one of my favorite rock/blues musicians (Dave Press) who was more than happy for me to use his song. This won’t always be an option though so I started searching for a simpler solution, It wasn’t long before I found CCMixter. CCmixter is a place where you can download open source audio for use in projects. Searching on CCMixter is easy and downloading tracks did not require any sign up. 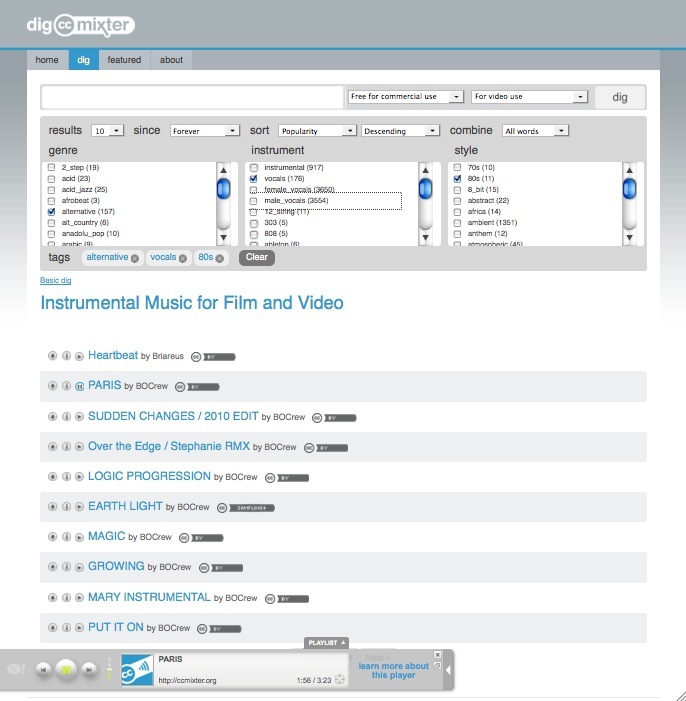 dig.ccmixter.org is their nice music finder tool. 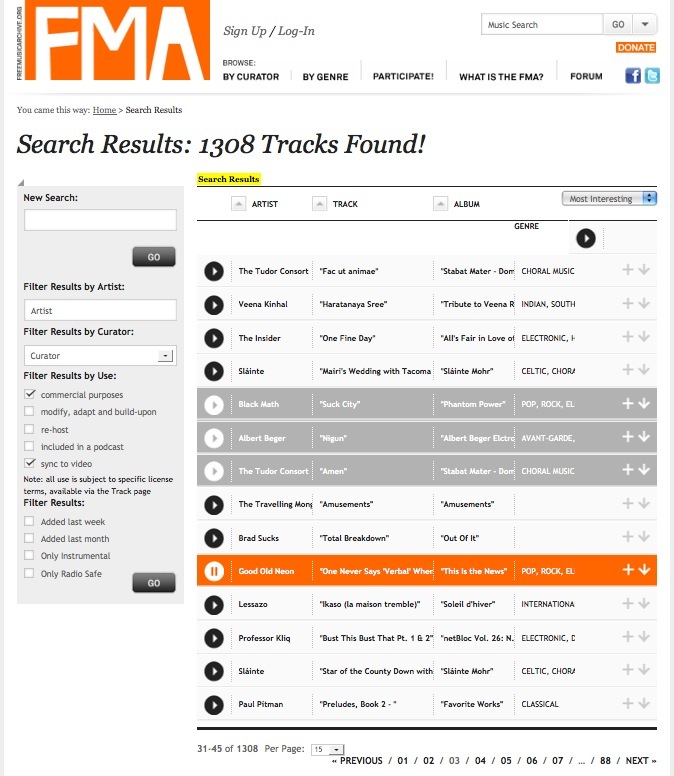 You can add search options such as instrument, genre and style to help you easily find the right track for your video. In their free for commercial use section you can find thousands of full tracks which you can freely download and use for videos even if they are commercial in nature. All they ask in return is that you let them know where their tracks are used so that the artist can add it to their portfolio. The FreeMusicArchive is another great place to easily browse creative commons music and download tracks without the need to sign up. What are your favorite places for free resources? Where do YOU get music, stock video and images or even Motion/AE templates and graphics? Tell us in the comments. Note: NextWaveDV and Nitsan Simantov do not have any connection with or guarantees regarding the websites listed above or the legality of their use. You can find out more about creative commons here. Fantastic resources here all new to me! Awesome information! I only wish it were easier to use the players for both these sites so I can move quickly through the music to determine a viable choice for my video projects. But free is great! I just inked a deal with http://www.magnatunes.com for unlimited, lifetime, royalty-free commercial-use songs. They license ala carte ($100/song) or you can choose a basket of songs to license (yes, you choose the contents of the basket) for a smoking better deal. The selection and quality of the songs is very good and they provide you with the artist contracts (if you ask for them) to ensure your clients’ arses are covered. Thank you so much this is a great help!!! Very helpful for a rookie like myself, thanks a ton! Not sure what I’m doing differently, but I only get 9 results from FMA… And the CCMixter site doesn’t seem to be working at all… ??? Maybe too many people caught on to this and they stopped hosting so much free content?